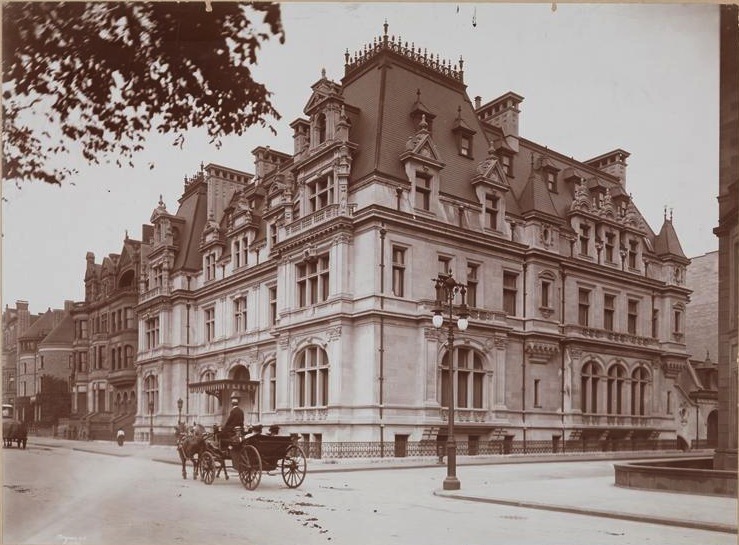 The John Jacob Astor IV residence designed by Richard Morris Hunt c. 1896 at 840 Fifth Avenue and East 65th Street in New York City. Click HERE for more on 840 Fifth Avenue. 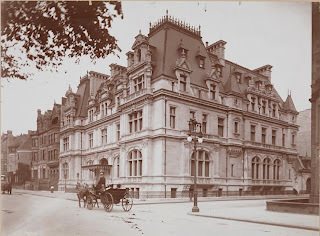 Photo from the Museum of the City of New York. Before the Civil War, and for some years after, railroad men bought up much of Manhattan's garbage and debris to firm up the land around what's now Jersey City. When all these great houses were torn down (from 1900, say, until 1950), where did the rubble go? If memory serves me right they dumped the remains of the original Waldorf Astoria in the harbor in 1929. She doesn't put a foot wrong anywhere, and that's very rare. Here's a terrific photograph of the covered court of this house---lush, vast, magnificent, beautifully executed---and cold and heartless. Not a house with happy stories to tell.